Bon Secour National Wildlife Refuge is be offering free guided walks on Tuesday, Wednesday, and Thursday of each week starting on January 28th 2014 and continuing until March 6th 2014. The tours include a Bird Walk, a Nature Hike, and a Dynamic Dunes Beach tour. They are free to the public, however a reservation is required. The walks are limited to 12 people per tour and will consist of a 1-2 hour walk. A 24-hour notice is requested for cancellations. You are encouraged to bring binoculars but they are not necessary to enjoy the walks. Restroom facilities are available at the refuge office and on the Pine Beach Trail. 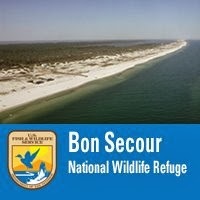 The Bon Secour National Wildlife Refuge is open during daylight hours only.